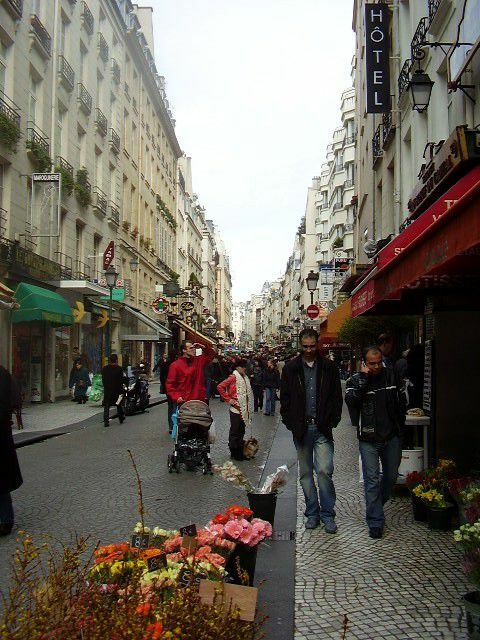 One of Paris' oldest market streets, and nestled in Paris' ultra-central 2nd arrondissement on the right bank (rive droite), Rue Montorgueil is a pedestrian-only zone lined with some of the city's best fish, produce, and fine grocery shops. Yet the are remains mysteriously overlooked by tourists, who often bypass it as they visit major attractions such as the nearby Centre Georges Pompidou or the old mansions of the Marais district. The shopkeepers here are known for their enthusiasm and their old-world warmth, so when you visit you'll be sure to hear cries (or even songs) announcing fresh salmon, peaches, or cheeses on sale. Though Rue Montorgueil is in the smack-center of the city, it retains a small village atmosphere. Au Rocher du Cancale is a restaurant that has been open since the mid-19th century. The eye-catching building on Rue Montorgueil is decorated in an ornate neo-Renaissance style. The restaurant, well known for its seafood platters, attracts crowds, especially when the weather is warm and you can enjoy their terrace outside. People-watching on the bustling pedestrian street is a must. Rue Montorgueil's shopkeepers are known for unconventional displays of whimsy. Here, a merchant selling spice bread (pain aux épices) enjoys a game of chess between customers. Market culture in Paris is still very vibrant, and while it takes some time to get to know the local purveyors of cheese, baked goods, fruit, vegetables or fish here, once you do, you can always expect a warm smile (and a dose of old-fashioned Parisian teasing, never to be taken seriously). A cow graces the storefront of one of Rue Montorgueil's fine cheese sellers. If you're interested in sampling some fine cheeses from the country's many esteemed regions, this area will do the trick. Also try Rue Cler in the 7th arrondissement, or Rue Mouffetard in the Latin Quarter. La Maison Stohrer is one of the the oldest and most revered Parisian patisseries (pastry shops) and caterers. The shop on Rue Montorgueil is the oldest and opened in the early 18th century. The storefront and interior alone are admirable for their elaborate frescoes and carvings. This shot, taken on a Sunday, gives a sense of how crowded the store gets, especially during the weekend. In France, pastry makers are traditionally held to strict standards of aesthetics-- a pastry must not only taste fantastic, but look perfect. The pastries at La Maison Stohrer are among Paris' most beautiful. This 15th-century structure in the center of the Etienne Marcel fashion district is Paris' only fortified medieval tower. The infamous Duke of Burgundy, or "Fearless Jean", assassinated his cousin the Duke of Orleans here. Visitors can climb the tower's spiral staircase and explore several rooms. Getting There: Take metro line 4 to Etienne Marcel. The tower is located at 20 rue Etienne Marcel. Open daily except Sunday, 1:30 pm-6:00 pm. See the official website for more info. The Saint-Eustache Church dates to the 16th century and was long considered a church of royalty due to its proximity to the Royal Palace at the Louvre. The church boasts some of Paris' largest organs. Construction was never completed, giving the church its somewhat odd appearance. Known as "the belly of Paris", the monstrous shopping center at Les Halles in central Paris was, up until the mid-20th century, the location of Paris' most important open-air market. For hygiene reasons, the market was moved out of the city center to a south suburb. Les Halles shopping center is notoriously labyrinthian and difficult to navigate, and its design never quite won over the public. After being gutted and completely renovated, Les Halles reopened in 2016 and is so far well-liked by Parisians and tourists. The warm yellow colors, heavy use of glass and metal and sweeping angles employed in the design evokes some elements of Belle Epoque architecture, while also having a contemporary feel. Rue Rambuteau is lined with shops and extends from the Eglise Saint-Eustache and Les Halles to the Centre Georges Pompidou and the Marais. Take this street down from the Eglise St Eustache down to the Centre Pompidou to explore the vibrant neighborhood known locally as "Beaubourg".